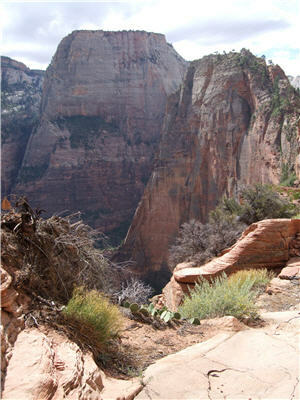 I’ve just returned from a hiking trip in Utah where, one afternoon, I saw a young woman reading from a Kindle at Scout Lookout, a destination point in Zion National Park. I figured she was reading while her husband headed up to Angel’s Landing, an additional half-mile climb with shear drop-offs on either side. Observing the reading woman, I wished I’d also brought my book — Angel’s Landing was too frightening for me — but then, I was reading a 482-page paperback, Christos Tsiolkas’ The Slap. There was no room for it in the backpack with the rain gear, water and snacks. Big points there for the slim Kindle. That evening over dinner with my fellow hikers, I mentioned the Scout Landing Kindle reader. A husband and wife jumped in to express love for their Kindles and the convenience of no longer having to carry print books. Their animated remarks indicated — as is typical for e-reader aficionados — that anyone who rejects the e-reader trend is a Luddite. I didn’t mention right away that I had indeed done just that, tried and rejected the Kindle. When I eventually confessed, I could feel emotions heating up, as if we were defending rival political candidates. No matter what I said, my print candidate was stuck in the past and not the obvious future leader. Even my comment that I believe print and electronic books can co-exist was dismissed. My love of signed, rare books was acknowledged (they have them, also) but designated as valuable relics. Here’s the rub: The wife of the Kindle-reading couple works in the New York publishing industry. I’m not against e-readers. I’m fascinated by how they’re transforming the reading world, clearly with major benefits that go beyond portability. The husband in this Kindle reading team suffers from bad eyesight, and he increases the font size not only for his books but also the daily newspapers he receives on the Kindle. It makes reading much easier for him. And when I recommended a book for his wife, she said she could download it that night. Who knows, someday, when the e-readers get worked out and priced right, maybe I’ll find one I like to slip into my suitcase and backpack. That said, I only saw two Kindles/e-readers on the trip. Everyone else on the airplanes and shuttles or poolside whom I saw reading had print books. Which is to say, we’re all still carrying them around with us, no matter where we go. A woman in my group carried Father of the Rain by Lily King with her in the van that took us to our hiking spots. One day, while the rest of us were finishing lunch, she went off to sit on a log and read this novel that entranced her. (She told me she couldn’t put it down.) Sure, a downloaded version on a Kindle would’ve been much easier to carry, as we shuttled around Zion and Bryce canyons, but I don’t think that would appeal to her. She told me she liked holding a physical book. Big points there for print. ‹ PreviousTaking a short break. Back soon. A cartoon in today’s newspaper showed a parent and child walking past a library. The parent tells the child, “That’s a MANUSCRIPT MUSEUM.” Kind of chilling if you think about it. I’m glad you had fun. Please tell us if you hit the mark on the books you packed! It is a bit chilling because it feels like that someday could be true. Readers will know nothing else other than reading on a screen, and they’ll look upon our common reading style as ancient, as we now look upon scrolls. First, I did that same hike (Zion and Bryce) about 3 years ago! It was a gorgeous trip and Zion definitely captured my heart and attention for continued pursuit into the outdoors. Second, now that the Kindle price has dropped to below $200, I’m curious whether that price point pushes it more toward your consideration? My roommate and I, and most of the friends I know prefer the printed version. I wonder if it’s the physical interaction with the book, the feeling of ownership of more than just a large .epub file, or something more ethereal which has us clinging onto the printed version. I have the Kindle app for my iPhone and use it from time to time for some Project Gutenberg prints, but nothing has yet replaced the love I have for my bounded collection. Great thoughts TLC, thank you! I understand how Zion captured your heart and attention in that way. It’s a gorgeous place! I don’t think the price point will make much difference for me regarding the Kindle. I don’t like the e-book experience, especially when it comes to flipping backward to check something earlier in the book, or wanting to mark a passage with a sticky note, or dog-ear a page. And like you and your friends, I like the feeling of ownership, and being able to see my books and reach for them on the shelf. I believe we’ll have both versions for a long time, digital and bound books. Or maybe that’s my hope, because I would hate to see the demise of books in print. Thanks for checking in. Good to see you here!